"These beans turn out fabulous in the slow cooker! 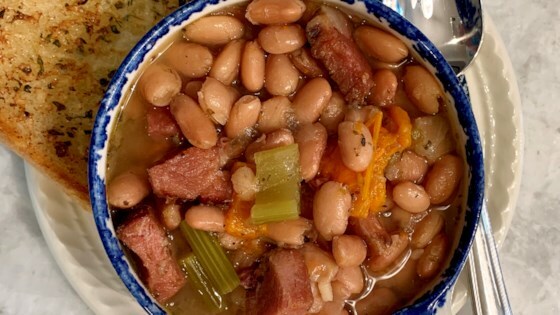 I developed this recipe after finding too many hard beans after cooking with a pot on the stove." Cover pinto beans with water in a large bowl; allow beans to soak overnight. Place onion, green bell pepper, celery, garlic, Black Forest ham, soaked pinto beans, cumin, oregano, bay leaves, and lard in a slow cooker. Pour enough chicken broth into the slow cooker to cover the other ingredients. Cook on High until beans are very tender, 5 to 6 hours. The beans were soft, but the recipe was too spicy for my kids. Next time, I will not use as much cumin and add some sweetness to compliment the ham. Instead of ham used 2 smoked turkey legs. Great taste and healthy!! !